3dcart is an ecommerce platform used by over 17,000 entrepreneurs to sell online. Connecting your 3dcart store with Fomo is easy and does not require any coding experience. Important - if you don't already have a Fomo account, create one. Also, make sure to add your 3dcart Secure URL to Fomo before continuing this guide. While logged into your 3dcart store admin, visit Modules on the left side, and search for the REST API application. Ensure the module is expanded by clicking the '+' plus symbol, then click the small 'Change Settings' link below the Rest API module. Note: your screen may look different here, if you already have other apps enabled. Click the 'Add' button in the top right of your screen. Finally, enter this string of text in the Public Key input and hit the Save button on the right side of the input box (not the top-right "Add" button). After clicking 'Add' on the far right, you should see a small popup that asks you to grant permissions to Fomo. You're almost there. Fomo is now syncing live with your store orders, we just need to install a small widget on your storefront so your shoppers can see them. 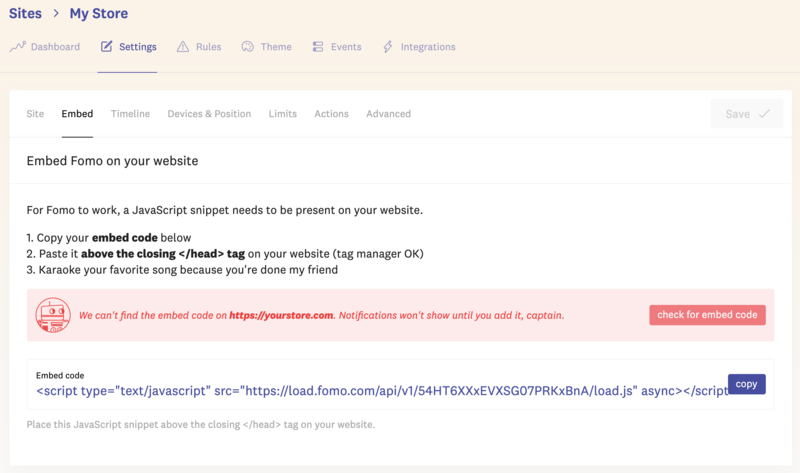 To do this, first get your Fomo embed snippet from Fomo > Settings > Embed. Next, in your 3dcart admin panel visit Settings > Design and find the 'Edit Template' option near the top right of your theme, in a dropdown. Scroll carefully down the file (or search the page with cmd+f or ctrl+f) until you find "</head>". It's ok if there are other files, or line breaks, etc that make your file look different than this. Lastly, click 'Save' in the top right to update your theme with these changes. New orders on your 3dcart storefront will now be imported to Fomo, and streamed live on your site. Fomo has been proven to increase conversions for thousands of ecommerce stores around the world -- we're happy to have you on board. To edit the message structure of your Fomo notifications, simply head to the Templates tab of your Fomo dashboard and find the '3dcart Order' message.